I am proud to have served with the U.S. Air Force, and to have been assigned Special Duty as the Sgt In-Charge / Tyndall AFB Honor Guard . I am privileged to have assisted in raising a great family. I always promote "Family Values". The professional science fields of Meteorology, Physics and Astronomy have been achieved by my sons. Insurance Defense, Personal Injury / Internal Affairs of government entity, when independent investigation is needed. Former Law Enforcement Officer. Former Special Investigator with an Indianapolis, IN based agency. Graduate of "dektor counterintelligence" (1976 qualifying as Lie Detection Examiner). The merger of common sense and personality, with progressive business experiences as a Licensed Agency for over 35 years. I am a participating member of the Fraud Defense Network. 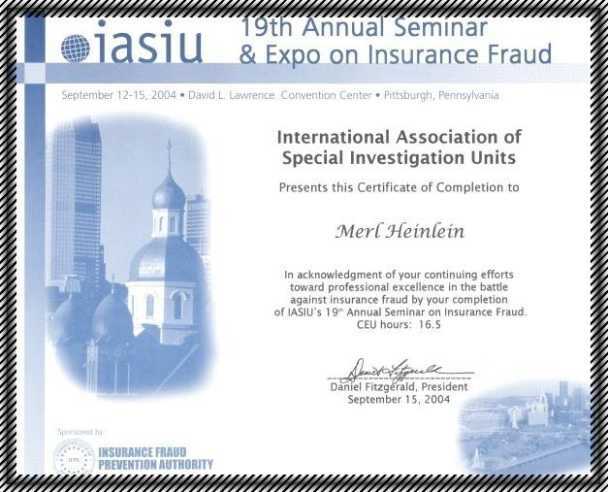 This Network is comprised of Insurance Carriers and Investigation Specialist. Indiana Truth Verification Association (Chairman Of The Board), International Academy Of Criminology, National Association Of Chiefs Of Police, Indiana Association Of Private Detectives (Acting President), World Association Of Detectives (Public Relation & Seminar Committees), The Society Of Professional Investigators, Service Member -- Illinois Association of School Administrators. This line is a link to an addition page, giving a portion of what the Honorable Paul Harvey might refer to as "The rest of the Qualifications"
National Association of Investigative Specialist / Lifetime Member, Disabled American Veterans (DAV).